It had been a whirlwind week, followed by a busy weekend leading into another week that’ll be more of the same. Major events are kicking up in her organization, and rehearsals and performances fill my evenings. Dinners together will be the exception rather than the rule. It’s easy to get focused on what has to be done at work and then discover a load of clothes put in the washer on Tuesday hasn’t been moved to the dryer until Friday. Or that we’ve driven past the market while holding the shopping list. We remembered lunch, though. She had it nearly ready by the time I got home. All that was left was to grate the cheese I’d just brought–after I remembered where I was going and circled back for it. Pasta was bubbling. Cream simmered in a saucepan, flecked with perky strands of lemon zest and dark green rosemary. I squeezed the lemons for her before she realized that the recipe called for zest but not juice. That’s okay; I’ll make lemon soda sometime soon. She stirred in the cheese, steamed some asparagus to add, and brought everything together. The sauce was beautifully balanced between tart citrus, rich cream, and salty-sharp parmesan. A sprinkle of cayenne and a few grinds of black pepper contributed a little warmth, and the asparagus brought its unique earthiness. Nothing overwhelmed another–which is good, since we were both a little overwhelmed by life. The recipe she was following didn’t include the asparagus, but I’m glad we did. Vegetables are always welcome. I’m sure we’ll try this again someday, perhaps with a little less cream and many more vegetables, as a pasta primavera. It’s time for that sort of thing, even if the thermometer doesn’t quite agree and there’s still snow on the ground. It might even be pleasant enough to linger over lunch on the deck. Not today, though, but that’s just as well; we had only enough time to clean up after lunch before going our separate ways for evening events. The time it takes to make a simple meal is always well-spent, and most certainly healthier than speaking into an intercom and having someone hand a sack of burgers to us through a window. Even when the meal is a bowl of pasta and cheese. 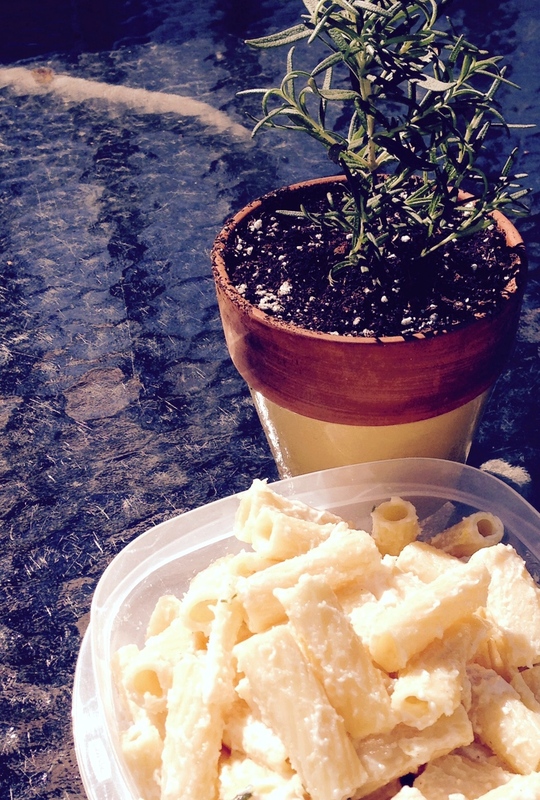 This entry was posted in Uncategorized and tagged Lunch, Pasta, Sunday, Work. Bookmark the permalink. I’m glad you enjoyed the story and hope you like the dish as well. Thanks for visiting!